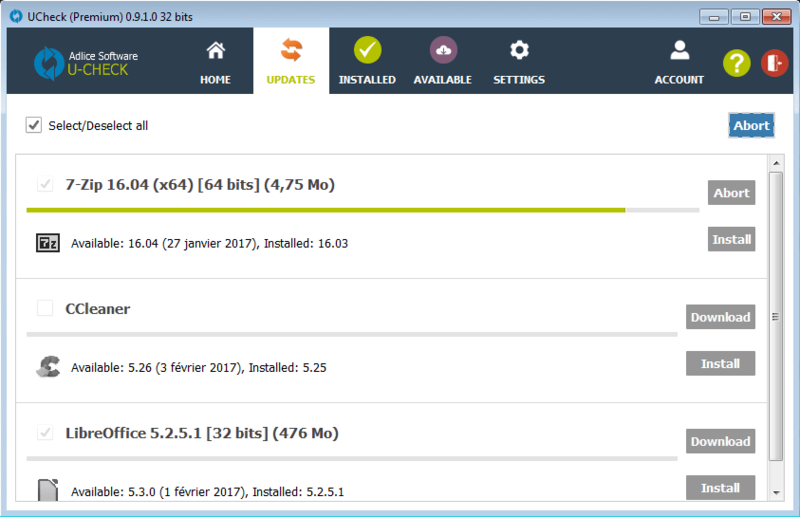 This is the official UCheck Documentation, a Software updates manager which can be downloaded here. The documentation is a basic walk-through, summarizing the features available in the software. If you click on “Download” button (if the button is present), UCheck will start to fetch the update locally, in a temporary location. Once the update downloaded, it should turn purple to notify it’s ready to be installed. Just click on “Install” button and follow the software installer. At the end of installation, the item will turn green to tell it installed with success. After a new updates scan it won’t show up anymore. In case the Download button is not present and you just have “Open official website”, it means no installation link was provided by the editor. 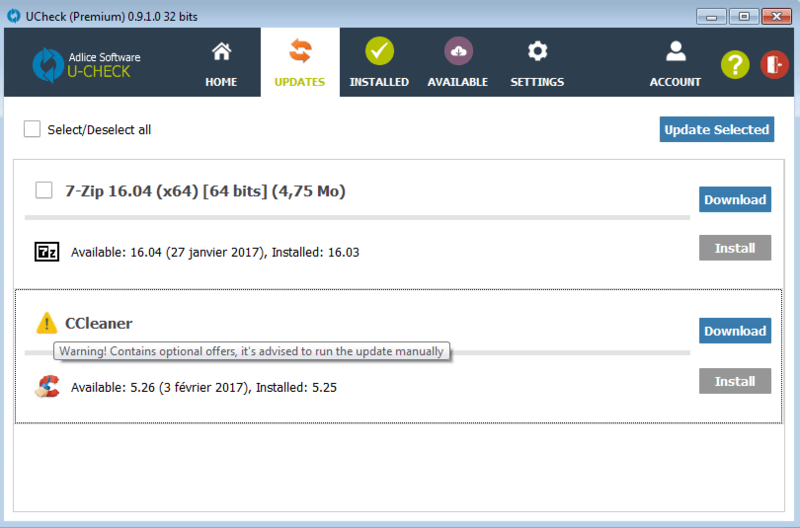 Thus, no easy update is available from UCheck, but still the software is monitored for new updates. To update such software, just click the “Open official website” button and download the update from editor’s website. 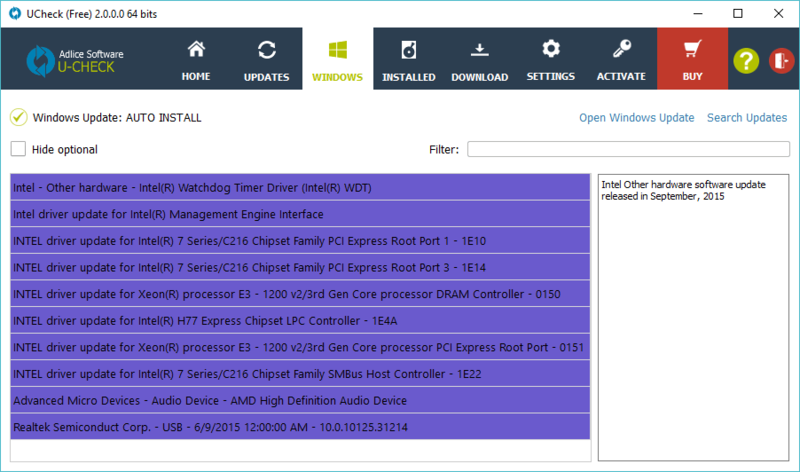 It is possible to install multiple updates at a time, without user interaction. To do so, select one or more items and click the “Update selected” button. Note: You need to run UCheck as administrator for this feature. Some items have a warning icon and cannot be selected into a bulk update, because their installer offers 3rd party software (also called PUP/LPI, unwanted software). We don’t want you to be infected with such optional offers and as such we prevent theses programs to be run silently. Windows Updates are critical when it comes to security. An outdated system leaves open bugs, waiting to be exploited. It’s very important to apply windows update as soon as possible when they are available. 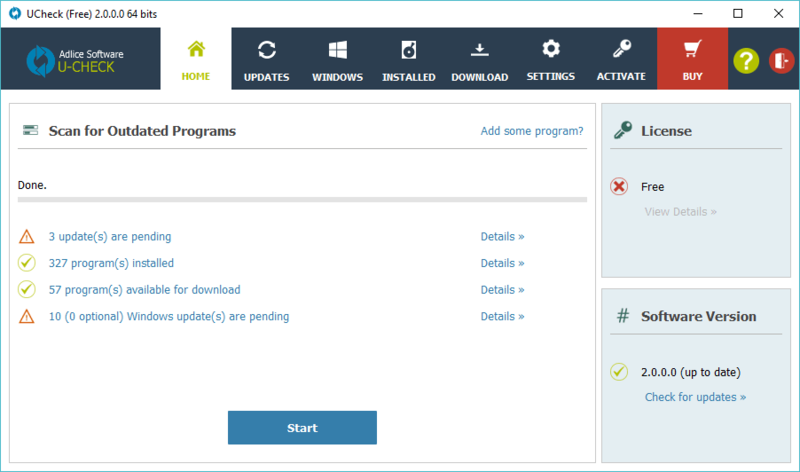 UCheck verifies if Windows Update is properly configured, and offers to fix if it’s not the case. Also, it will list any pending updates waiting to be applied in the “Windows Update” tab. UCheck comes with a software repository that we monitor for updates, but it’s not really useful if your machine is new and doesn’t have any software yet. This is why we also provide the ability to install the software we monitor, in the same way as we do for updates. Just find the software you need, check them for selection and click “Next”. Then, click “Install All” to install everything on your machine. Note: You need to run UCheck as administrator for this feature. 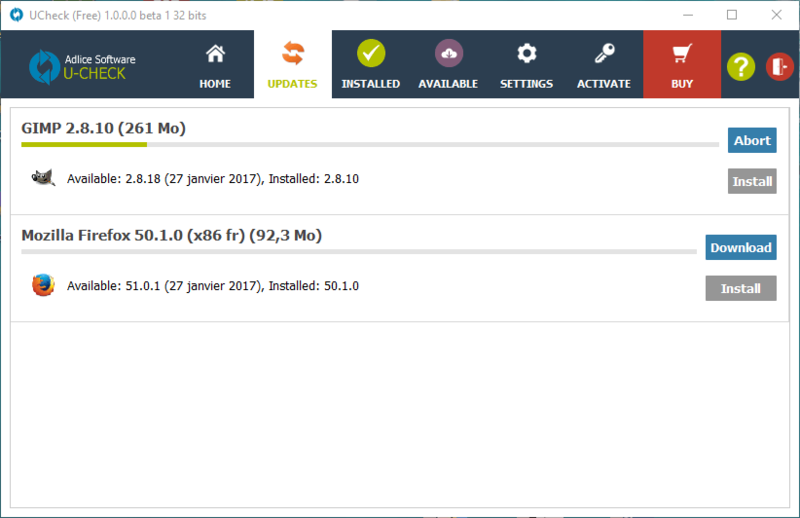 You can also install them manually with the individual “Download” and “Install” buttons. 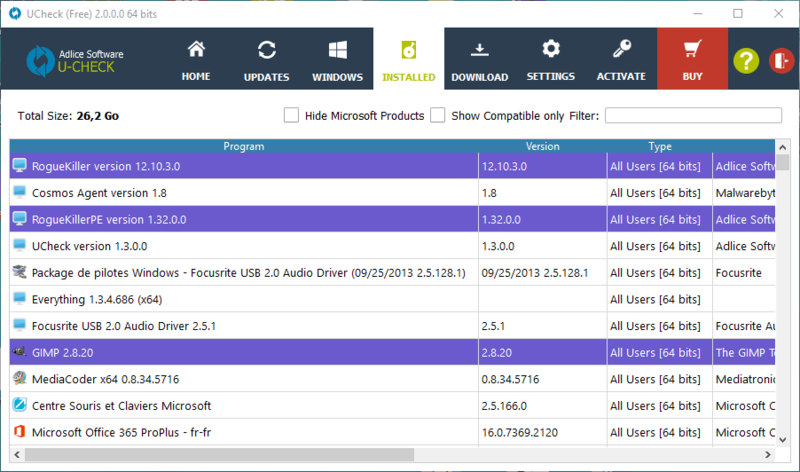 Last but not least, UCheck gives the ability to list installed software and uninstall them. To do so, navigate to the “Installed” tab, right click on a given program and choose “Uninstall”, then follow the uninstaller steps. The list can be filtered out with several options, including text filter, compatible filter and Microsoft filter. This list also tells which programs are supported by UCheck. 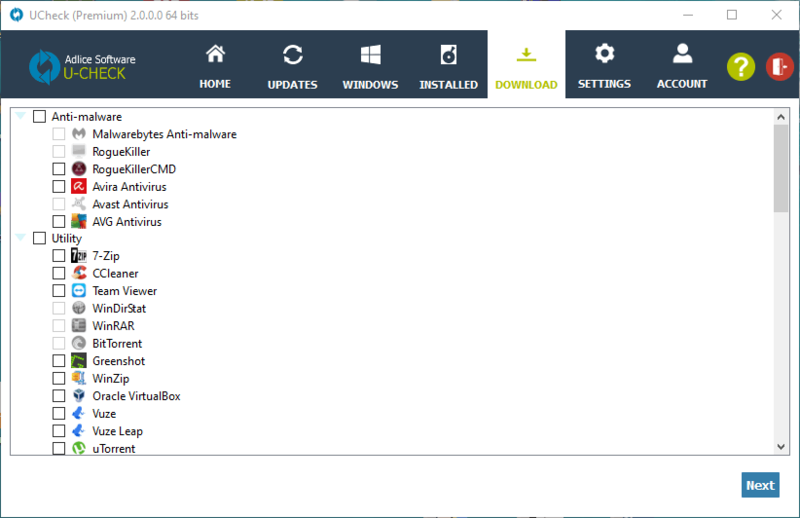 UCheck Premium Tech version comes with caching mechanisms, allowing to replicate the same update/installation on multiple machines without downloading the file every time. 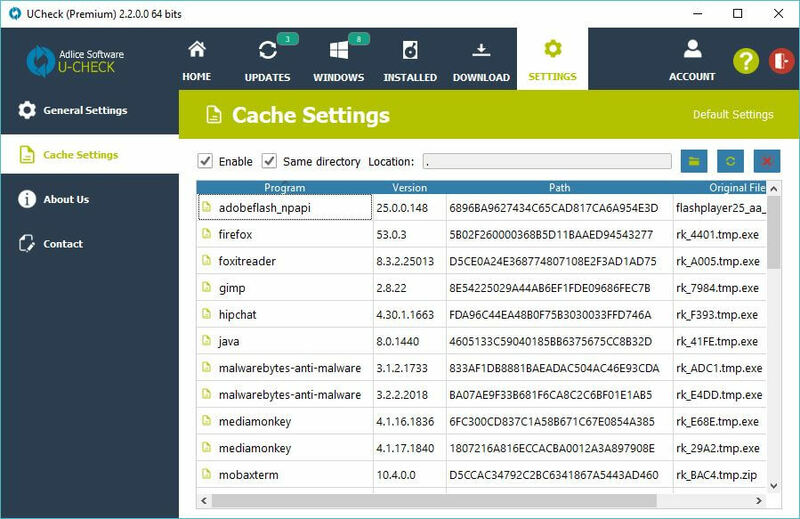 If you go into “Settings”, “Cache Settings”, you will be able to manage and view items in the cache, clean the cache or change its location. When you cannot update a software for various reasons, or you want to skip the currently available update but not the following ones, you can use exclusions. Click on the dropdown button next to an available update and choose either “Excluse software” or “Skip update”. In case you want to remove the exclusion, go into the “Exclusions settings”, right click on an item and delete it. On next scan the excluded item should be back in available updates (if any). Those parameters are all independent (do not forget the ‘-‘ character).